What is latex rubber tubing? Latex rubber tubing (abbreviated LRT) is a common way to make cylindrical CPS water guns. Latex tubing is the same tubing used in Super Soaker CPS bladders, so you can achieve similar to superior performance to the CPS series through simple latex tubing. 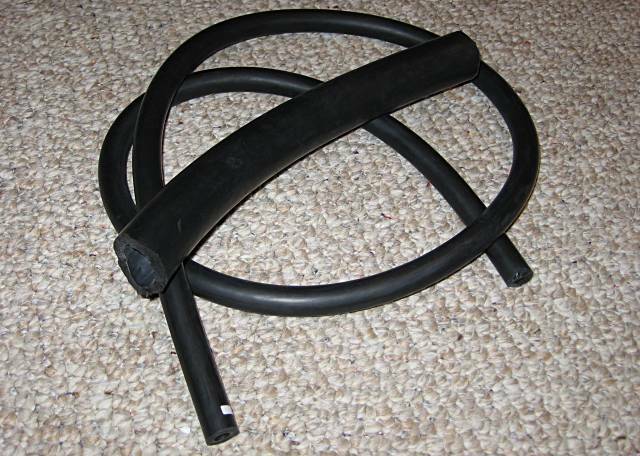 The above image shows two different sizes of black latex tubing. CPS is short for constant pressure system. A CPS is any water gun design that keeps pressure relatively constant. The Super Soaker CPS series popularized the rubber CPS variety that is the same as LRT. A modern example of rubber CPS is SuperCPS. The reason relatively constant pressure is desirable is obvious when you use any unregulated air pressure water gun. The pressure drops as the air expands, so the range and water output drop over the duration of the shot. Recharging to higher pressures is necessary in unregulated air pressure design. However, with a CPS, pressure and therefore performance stays similar over the entire duration of the shot. Latex tubing isn't a perfect pressure system for water guns, but it is very good. LRT is relatively cheap and has relatively constant pressure. The pressure is not completely constant--there is a noticeable drop in range over very long duration shots. However, it is constant enough to be called constant pressure. LRT's simplicity also makes it easy to build basic water guns with. The disadvantages of LRT are numerous. LRT has a very limited number of life cycles. When full expanded, the number of life cycles is less than 20 for a particular tube. The tube thins from tiny tears in the rubber. This problem can be minimized by reducing the expansion of the rubber by putting it into a PC container that is a smaller diameter than the rubber itself can expand to, but that reduces capacity somewhat and power slightly. Replacement is another option when power starts to drop. Another major problem is that the potential flow is reduced by the size of a tubing barb. Smaller inner diameter tubes have higher pressures, but the tubing itself reduces the potential flow because the hole water must flow through is smaller. This problem can be avoided to a certain extent by using tubing barbs slightly larger than the ID (inner diameter) of the tubing. Latex can be stretched over the tubing barb, but this process can be difficult on tubing barbs that are too large for the tubing. Another option is using larger diameter tubing, but that reduces the pressure and adds "dead space" that contains water that can not be shot out of the water gun. The third major problem with latex tubing is that it is hard to layer tubing to increase the pressure. This will be covered in more detail in another section. This page on a latex tubing distributor's website explains what wall, inner diameter, and outer diameter mean and how they are related. Latex tubing achieves relatively constant pressure though a simple mechanism. The tubing itself expands, first in diameter and then in length. It DOES NOT expand completely in length and then in diameter as some people believe before using it. By expanding, the force applied on the water increases. However, at the same time the inner surface area of tubing is increasing. The force and surface area increase in nearly linear proportion. Therefore, by the basic equation pressure = force / area, if the force and area are increasing in approximately linear proportion, the pressure is approximately constant. Following the basic equation pressure = force / area, if we assume that force is related to the wall thickness and we know that the area is related to the ID, then two relationships become clear. The thicker the tube, the higher the operating pressure. The smaller the internal diameter, the higher the operating pressure. LRT expands approximately 750% in diameter. Multiply the initial internal diameter by 8.5 and you will have an approximation of the expanded inner diameter. Add twice the wall to that and you will have an approximation of the expanded outer diameter. If you are layering tubes, count the outer tube as additional wall. If you limit the expansion of the tube then subtract twice the wall from the inner diameter of the PC case to get the PC's expanded inner diameter. The tubing also expands approximately 3 times the starting length in length. Both expansion figures are approximations. Consider these starting points for your planning, not accurate measurements. It is always best to measure because the properties of rubber do not exactly follow simple rules as I've described. With these approximations you can approximate how much water a piece of LRT will contain. Use the equation for the volume of a cylinder with the fully expanded diameter and length (or a desired length--it does not have to expand fully and it is a good idea to leave some extra to prevent popping). Subtract the volume of the unexpanded inner diameter's cylinder because that water can not be shot out of the water gun. Usually these figures are reported in inches, so the equation returns volume in cubic inches. Divide the volume in cubic inches by 61 to get how much volume in liters the cylinder contains. For example, if I have a tube with an unexpanded internal diameter of 3/8 inches and I want a length of 10 inches when expanded, the equation is volume = 10*pi*((3/8)*8.5/2)^2 cubic inches - 10*pi*((3/8)/2)^2 = 78.7 cubic inches. 78.7 cubic inches equals 1.29 liters. Again, let me reiterate that this is an approximation in several ways. The rubber only approximately expands to the figures I reported and the actual expansion will vary depending on temperature and the dimensions of the tubing. Also, the tube itself is not exactly a cylinder because the beginning and end of the tube are curved as is the mostly flat part. The numbers you get from these equations can only be thought of as rough approximations. The pressure rating places like McMaster-Carr tells is NOT a "maximum pressure" rating. As explained earlier, latex tubing keeps pressure approximately constant. If air of higher pressure is pumped in, then it will expand until it reaches the operating pressure. If water of higher pressure is pumped in, the pressure will dissipate until it reaches the operating pressure. LRT does not break from pressures that are too high--it breaks when too much volume is put in. This is a very common misconception. An approximate equation for pressure based on data provided by McMaster-Carr follows. McMaster-Carr sells small diameter tubes with pressures 50 psi or higher. Do not use these tubes under any circumstances. They will pop after a few expansions. If you are using these tubes for storing air (as in the case of Nerf guns), the burst of the tubing will be as loud as a shotgun. This has a very serious potential for causing hearing damage. Consider yourself warned. If we assume that the pressure is perfectly constant and some other things we can use a simple equation to approximate water flow from latex tubing. For the more technically minded here, this is derived from Bernoulli's equation with a flat constant added to it to compensate for things Bernoulli's equation does not cover. This equation is reasonably accurate for nozzle diameters less than 1/2 inch and pressures lower than 60 PSI. However, it is a greatly simplified version of reality that only serves to give you a rough approximation of how your water gun will perform. Things such as bends, improperly drilled nozzles, additives, increases in pipe lengths, reduction of inner diameter before the nozzle, etc. will affect performance as well. How much LRT to use in your water gun depends completely on how much water volume you want. 6 to 10 inches of LRT is a common size in water guns like SuperCPS. You can use the previously mentioned volume equation to get an idea of how long a piece of LRT you want to use. Generally, using more than you will need is a good idea because it prevents you from overpumping the PC and popping it. There will be extra volume acting as a safety mechanism. However, this does not prevent the chamber from being popped by an overzealous user, rather, it only increases the number of pumps necessary to pop the chamber. Having a large chamber is also a good idea to have a lot of reserve pressurized water on hand. Some people want to fill LRT with something other than water, so whatever you use LRT with be sure to check chemical compatibility. LRT should have an indefinite shelf life given that it is stored well. Heat, UV, and ozone are the most major causes of degradation in LRT. Store at 60 to 80 degrees F in a closed box away from ozone generating devices like motors and transformers. McMaster-Carr and other distributors are the most reliable places to buy LRT. There will be minimums of several feet but you can use the extra to build more water guns or replace your pressure chamber when it wears out. McMaster-Carr part number 5234K53 is a good general purpose tube with an operating pressure of 35 PSI. If you do not live in the continental United States, do some research to find a place that sells latex tubing. McMaster-Carr does not ship overseas, but other manufacturers like Primeline Industries do. Manufacturers directly also sell LRT, but at much much higher minimums than distributors. They have a much larger selection than distributors, but the minimums make ordering some tubes nearly impossible. One tube I was interested in buying had a 200 foot minimum at more than $6 a tube. Do not buy from hardware stores, home improvement stores, or medical stores. This tubing will work, but they limit their selection of tubes to extremely thin wall and small inner diameter tubes. Medical stores sell this tubing as "surgical tubing." The small wall reduces the operating pressure while the small ID reduces potential for flow. With that being said, you can still build a water gun from this low powered tubing, but it will not perform very well. Cutting LRT can be done with scissors. Cut using the part of the scissor blade closest to the joint for maximum leverage. Cutting rubber is odd--it bounces back and the thickness makes it hard to cut. The part of the blade closest to the joint has the most leverage so it is the ideal place to cut. Determine if you want to limit the diameter. If so, then use a tube of that diameter as the PC case. A dry lubricant like talcum power is recommended if the tubing is to touch the walls of the case to prevent friction from rubber to plastic contact. If you do not want to limit the diameter, choose a tube of a diameter the same size or larger than the approximate fully expanded outer diameter of the tube (8.5*ID+2*wall). This can be your PC case. For the standard tube I mentioned from McMaster-Carr earlier, a 3 inch pipe would work fine. 3 inch PVC pipe works but you might find a clear pipe like 3 inch PETG to work. With additional layers, a 3.5 or 4 inch pipe would be adequate. With a clear case, you might want to protect against UV radiation. 303 Aerospace Protectorant is recommended to protect LRT from UV radiation. Be sure to close off both ends of the PC case to be sure that if the PC pops and shoots off no one is hurt. To attach LRT to a water gun you use tubing barbs. Barbs with a male threaded end are the most common. Tubing clamps must be used to securely attach the LRT to the barb. Most tubing clamps will cut into the LRT because the LRT is too soft. For that reason, I recommend using non-cutting tubing clamps that are available on McMaster-Carr (part number 5076K13). You also can use a piece of tape to prevent cutting or cable ties instead of tubing clamps. Read the SuperCPS guide to see how to attach LRT with pictures. Layering LRT is advantageous because as discussed earlier, the thicker the wall of the LRT, the higher the operating pressure of the tube. Layering LRT can be difficult. Rubber on rubber has very high friction, so it is difficult to slide a rubber tube over another rubber tube if the outer diameter of one matches the inner diameter of the other. However, there are some methods we can use to help. The most basic method avoids the problem of rubber friction by using a tube of larger diameter to slide easily over. This is not ideal though because of the difference in diameters. For part of the contraction phase of the tubing, the outer tubing is making no contribution of the pressure, which can reduce performance slightly. I used this method in my most recent build of SuperCPS and I got about 52 feet of range with it alone compared to 60 feet or more with more close touching tubing. The second method involves using tension to make the inner tube thin enough to allow one to be slid over it. There are several different ways this can be done. One way is described by Killer 7 in this guide. If you overpump the LRT then the chamber will pop. Typically a pop only breaks part of the chamber--the bad part can be cut off and the remainder will be fine to use. When the entire chamber is popped replacement of the chamber is the only option. Does color matter in performance? Color makes no difference in performance. Can I pressurize around the tubing for a pressure boost? Sure, but it's not a good idea. Pressurizing around the tubing will lose the constant pressure unless you regular the pressure outside of the tubing, but that would make a more complicated system. Simple regulated air pressure would be simpler. The pressure on the outside will be additional stress on the tubing, likely reducing it's lifetime. This is also harder to implement than simple regulated air pressure or rubber CPS. Again, you can do this, but I very highly recommend against it. There are easier and more worthwhile ways to get higher pressures. Can I attach the chamber on both ends? Yes, as long as you make one end flexible because the tubing will expand in length. If you do not, the tubing can bend or crack your water gun or simply pop. You can attach something freely to the other end with a loose piece of vinyl tubing. Can you repair tubing with bike tire patches or rubber cement? No, LRT does not repair like that. Can I use more than one piece of LRT in a water gun like the Super Soaker Power Pak? Yes, you can. Be sure to use fresh tubes when doing this. If you use one old tube and a newer tube, the old tube will have thinned and only that one will fill. The tubes need to have approximately the same level of use and have the same operating pressure for this to work. Some people say they can't use LRT because their parents won't let them buy it or it's not available where they live. Alternatives include constant air/gas pressure, balloons, bike tubes, and other systems (be creative!). Tubing like Buna-N tubing can not be used often because it's not as expansive as latex. As I explained earlier, it is the linear proportionality of force and surface area that makes LRT constant. Unless that is preserved, the pressure will not be constant.